It is easy to make war and very hard to make peace. The experience of the Allies after the Great War shows that a flawed peace will only lead to more war. It is difficult to be generous in victory when your adversary has inflicted grievous wounds on an entire generation of young men and cost combatant countries their economic treasure. When the victors’ diplomats gathered in Paris in 1919 to negotiate what became the Treaty of Versailles, they faced an almost impossible task. Four great dominions that had governed much of Europe for centuries—in Germany, Russia, Austria-Hungary, and the Ottoman Empire—had disappeared as a result of five years of savage warfare. The Big Three—Woodrow Wilson for the United States, Georges Clemenceau of France, and David Lloyd George of England—attempted to put all the puzzle pieces together to serve their own partisan and conflicting interests. They then imposed their treaty on the defeated nations. 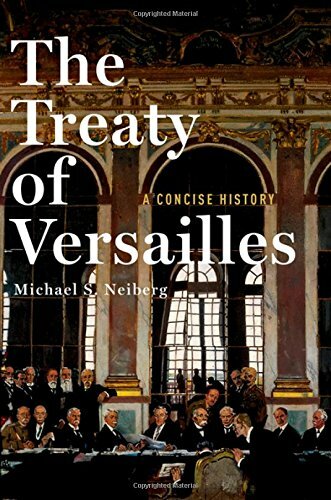 Michael S. Neiberg, a war historian, in a concise history of The Treaty of Versailles, writes a splendid precis of the post-war diplomatic battles. Students of history can learn from Neiberg’s book that less—his text is 101 pages long—can sometimes be more. It is a short introduction to one of the most important events of the 20th century. Participants in the Paris Peace Conference faced a herculean task, more challenging than simply seeking redress for wounds. The countries and empires of Europe had been at war for centuries, and this conference offered the victors the opportunity to rectify all past grievances. Much of the theater of the Paris Peace Conference was a reprise of the Franco-Prussian peace treaty, but with the parties reversed. The French sought retribution for the pride they had lost in that crushing defeat four decades earlier. However, they gained no euphoria through the negotiation process. Too many had died for that. They sought only honor and a bounty that would allow them to pay back the American banks that had loaned the French the money needed to finance their war effort. Personalities played a significant role in the negotiations. Wilson, Clemenceau, and Lloyd George were ignorant of global affairs. President Woodrow Wilson was a pompous and racist sophist who unilaterally announced the Fourteen Points he decided should guide the work of the Conference. First on his list was the establishment of a League of Nations where disputes between countries would be resolved by discussion without warfare. Of course, when the United States Senate failed to ratify the Treaty of Versailles, the League proceeded without American involvement, dooming whatever chance it had of success. The Peace Conference redrew the map of the world. Colonies of the defeated combatants were allocated to the victors as “mandates” rather than spoils. Poland, Czechoslovakia, Yugoslavia, Finland, Austria, Hungary, Estonia, Latvia, and Lithuania were “created” by the Treaty without regard to the desires of the inhabitants. Apparently, Wilson’s call for popular “self-determination” was no impediment to the process. Many historians claim that the Second World War that started two decades later was the direct result of the faulty peace process that ended the “war to end all wars.” There is little doubt that Germany felt aggrieved by the Treaty of Versailles, but Hitler’s later aggression and mass murder was motivated by more than mere retribution. It was an attack on Western civilization by a barbarous and evil misanthrope. Could a better pact have avoided the later catastrophe? It is impossible to know.